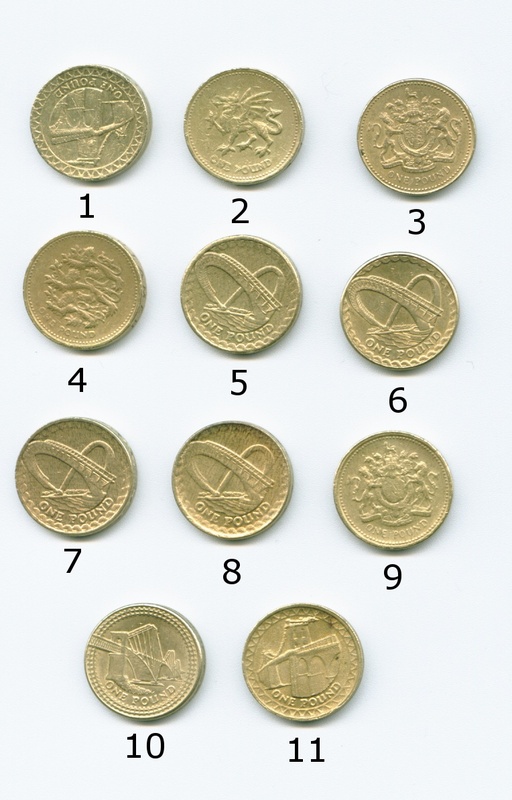 There's guides on identifying these fake coins at the BBC and The Independent websites. I also read some comprehensive pages on the one pound coin and known forgeries at coinauthentication.co.uk and read a three part blog with someone's experiences with fake pound coins. If you're interested, there's a list of yearly distribution of the coins below. Generally look like a proper coin and not like a chocolate coin. The industry refers to poor quality counterfeits as "soapy", meaning that they are indistinct. From my selection of 500 coins, I have found 11 which I am certain are fakes. There's scans of each of the coins below for you to look at with my descriptions. Coin 1 is one of the more convincing fakes. It has clear markings and the edge markings appear clear and crisp. The reverse pattern showing the Menai suspension bridge is correct for a coin minted in 2004. The error is that the reverse and the obverse are 180 degrees apart from each other. Genuine coins always have the obverse and the reverse pattern in line when you turn the coin around. Coin 2 also hasn't fallen into the trap of using the wrong year and reverse markings. It is a 2000 coin and shows the correct Dragon Passant representing Wales. This coin has failed because the edge marking says "DECUS ET TUTAMEN" instead of the Welsh "PLEIDIOL WYF I'M GWALD" which should be present. Not only this but the inscription is of very poor quality, varying in height around the coin and with poor quality lettering. The milling is also absent for some of the coin edge and the whole coin looks like it may be made of chocolate. Coin 3 has by far the best quality embossing of all the fakes here. The level of detail on the obverse and reverse is superb and the milling is of good quality all the way around the edge. The quality of the lettering on the edge isn't the best in the world but it is far superior to some fakes. What really gives this one away is the year. There were no one pound coins minted in 1998! This is one of the most worrying fakes here. Apart from some slight problems with the edge lettering it is hard to tell this is a fake with the naked eye. I'm sure microsocopic examination would reveal defects but who carries a microscope to the shops? Coin 4 is easily detected. It has the correct designs and inscription but the reverse and the obverse are about 20 to 30 degrees off perfect alignment. Also the edge milling is decidely poor (covering only about 60% of the height of the coin) and the lettering is clearly not genuine. I have included a scan of the edge of a genuine coin at the bottom of the photo for comparison. Coin 5 is the first in a series of fake 2007 pound coins. This year appears particularly bad for fakes based on my sample. The edge milling is poor quality and the stamping of the two overlapping lines that should be there is patchy with parts of the coin without much stamping present. Coin 6 is the coin which I am most unsure about. In almost every respect it appears to be genuine except that part of the reverse markings in the lower right hand side are much more indistinct than the majority of similar coins. I have listed it here because the differences between this coin and the others minted this year warrant an inclusion. I shall leave it open though as to whether this is a genuine fake! Coin 7 is another 1997 fake and is of very poor quality indeed. The whole coin has an unnatural yellow colour and the details are indistinct. Soapy is a good description for this coin. The reverse stamping is off-centre and the edge rim is missing around the 9 to 10 o'clock position. The milling is atrocious although the embossed line is clear, even if it isn't half way up the side of the coin. Coin 8 is yet another 1997 fake. The whole coin looks as though someone has applied a soft-focus to it. The letters on the obverse almost disappear during "REG" and the rope design around the edge of the reverse appears as just a smear. The edge is one of the worst here with most of the edge un-milled and the embossing of very poor quality. Coin 9 has almost a complete set of fake coin markers! 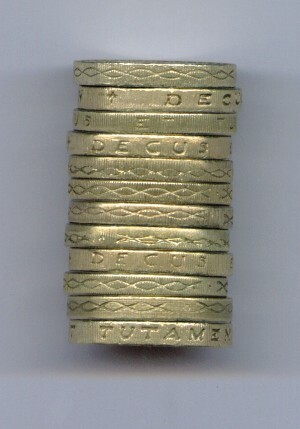 It is struck in 2002 yet the reverse shows the ornamental royal arms used in 1983 (and 2008 to a limited extent). It should instead show the three lions passant guardant representing England. Not only is it the wrong design for the year but it is rotated at around 20 to 30 degrees from the obverse of the coin. The back of the Queen's head appears to have been steam-rollered flat into the table of the coin and not only is the milling of poor quality but the lettering is narrow and indistinct in places. Also, the Llantrisant mint mark (the little cross between the end of tutamen and the beginning of decus) is missing any of the fine detail and small crosslets. There's some great pictures of both genuine and fake mint marks available at this page on counterfeit pound coins on coinauthentication.co.uk. Coin 10 carries the correct reverse pattern (the Forth bridge) for 2004 but the rail lines around the reverse are not as distinct as the majority of similar coins. Not only this but the edge milling is unfinished and poorly defined in places. Coin 11 doesn't start well since it looks like it has been sprayed yellow with paint. If we ignore this then the not-quite-perfect alignment of reverse and obverse is a good sign that it's a fake, not to mention the complete lack of milling around the edge of the coin. Although I've not included them here, I'm not certain that all the coins from 1984 were genuine since they appear to have worn much more than others from the same year making the years hard to read amongst other details. I'm prepared to give these the benefit of the doubt though since they have been in circulation for about 25 years! These are the edges for each of the fake coins. They start with coin 1 at the top and work down. Coin 12 is a geniune coin included for comparision purposes. In summary, I found 11 coins out of 500 that I am certain or almost certain are fakes. That's 2.2% so broadly in line with official estimates of 2.5% although 2007 appears to be a particularly bad year. I am certainly not going to disbelieve the professionals who claim 5% though since I can imagine more careful forgers producing coins that I can't tell from genuine with my naked eyes. For those that are really interested, here's the coins that were present in the randomly selected 500 from the bank. http://blog.alism.com/fake-one-pound-coins-part-two/ - Part one of a series of blog entries on fake pound coins. 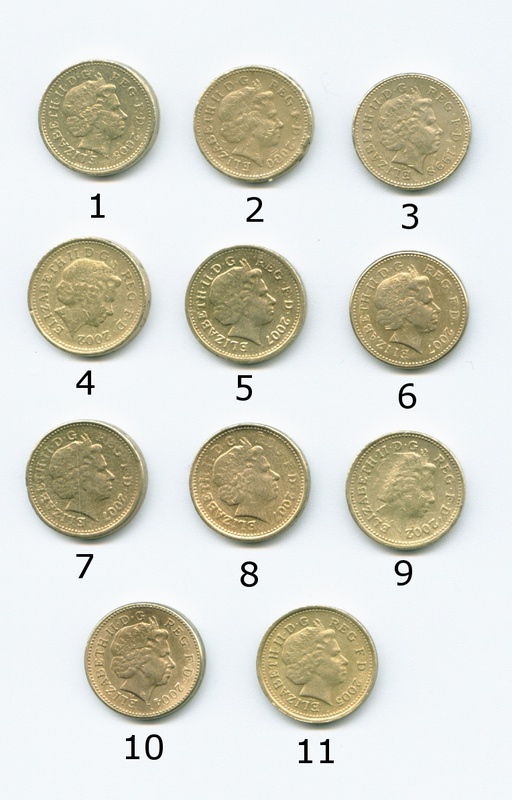 http://wiki.chiark.greenend.org.uk/HowToSpotAFakePoundCoin - A page on identifying fake coins and the legal aspects of using them. http://www.coinauthentication.co.uk/poundfiles.html - A very comprehensive page with many sub-pages on types of counterfeit pound coins. http://www.ukcoinpics.co.uk/dec1p.html - A page with pictures of both genuine and fake pound coins. First published on 31st December 2009 and last modified on 21st March 2011.